One of the biggest events in sports happened last week— The Masters! It was a week-long event full of great scores, celebrations, and eventually, one very happy (and local) winner, Jordan Spieth. With all of the excitement going on, I couldn’t help but think about our own golf course and its excellent qualities. After you hear more about our WinStar Golf Course, I think you’ll be rushing to book your own tee time! Our 27-hole course with over 280 acres of gorgeous views was designed by professional golfer D.A. Weibring, and is versatile enough to accommodate any skill level. Whether it’s your first time to pick up a club or you’re regularly shooting a par score, you’ll be able to maneuver around this course perfectly. Due to this well-planned design, we’ve hosted many successful professional tournaments as well as beginner’s clinics throughout the years. In addition to the above, we’re currently running a Stay and Play promotion. In this package, a one-night stay, two rounds of golf, practice balls and golf carts are included for the price of $199 Monday-Thursday; $299 Friday-Saturday; and $229 for Sunday. For more information or to reserve your stay, call 866-946-7787. Remember earlier when I mentioned the gorgeous views? 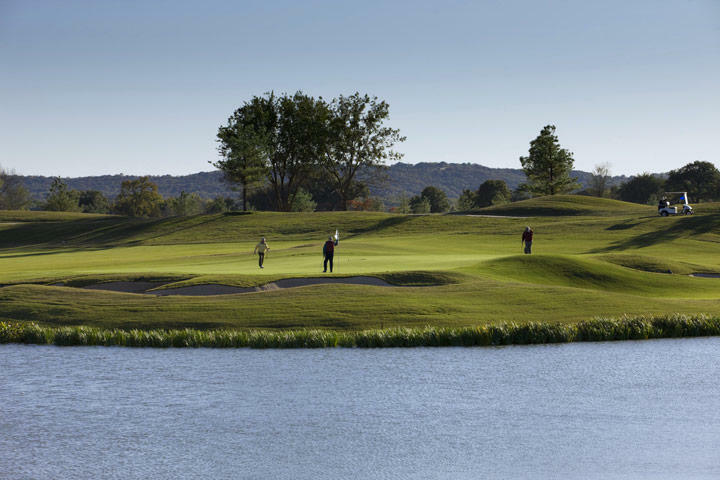 Below is just one of the many sights you can enjoy while playing at WinStar Golf Course as it’s perfectly situated between the Red River Valley and the Oklahoma foothills. It’s hard to beat that! The course design, reasonable pricing and beautiful surroundings are all reasons why you should consider us for your next golf outing. They’re also the reasons why we were voted as the Best Golf Course in the “Best of Chickasaw Country” competitions for 2015 and 2014. And finally, we have several exciting promotions planned for the upcoming months. Like our Facebook page and you’ll be sure to see all our exclusive offers. To learn more about our course or to book a tee time, visit our website or call 580-276-1240. Now’s the time to take advantage of the beautiful weather, so we hope to see you out on the links soon!